This delicious jelly will make a wonderful homemade gift for the holidays or can be a great way to spice up the traditional holiday meal. Who doesn’t love homemade gifts? I decided to make some homemade jellies, but wanted to do something a little different. Rather than giving them the regular jams that I make in the summer, I wanted to bring a little winter variety into the mix and try my hand at making pomegranate jelly. Everyone I know loves pomegranates and the color is so gorgeous. So, why not make this into a jelly? The results were great! It was tangy, sweet and has a variety of purposes. It can replace cranberry jelly with turkey for the holidays or to top hors d’ oeuvres (my favorite is topped over baked brie). As well, it is a lovely accompaniment to breakfast toast, scones, and biscuits. There is still time to make this delicious jelly as gifts for friends and family. Wash and sterilize canning jars. Boil the flat parts of the lids in a small pot and keep at a low simmer. 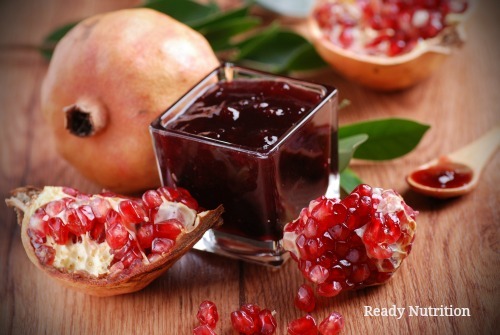 If you are using fresh pomegranates, peel pomegranates and extract juice. Strain juice through cheesecloth. Tip: If you juice your own pomegranates be sure to let the juice rest for 12 to 24 hours so the sediment will go to the bottom. Only use the clear liquid if you want your jelly crystal clear. In a large pot over medium-high heat, add juice, lemon juice and pectin. Bring mixture to a full rolling boil over high heat, stirring constantly. Stir in sugar to mixture and stir regularly to prevent scorching. Bring to a rolling boil and boil hard for 1 minute, stirring constantly. Remove jam from heat and let sit for a couple of minutes, stirring occasionally. It will thicken slightly. Remove any foam that has occurred. Ladle jam into hot jars leaving 1/4 inch space at top of jars. Clean rims, then place flat lid on jars, and add screw bands. Immerse jars in hot water bath, and boil rapidly for 15 minutes (check your elevation areas and adjust the cooking time accordingly). Remove from bath and place on a towel on the counter to cool. If jars aren’t sealed within 12 hours then move them to the fridge and eat within 2 weeks.